Now that we’ve officially entered grilling season, it’s high time for some delicious summer side dishes. 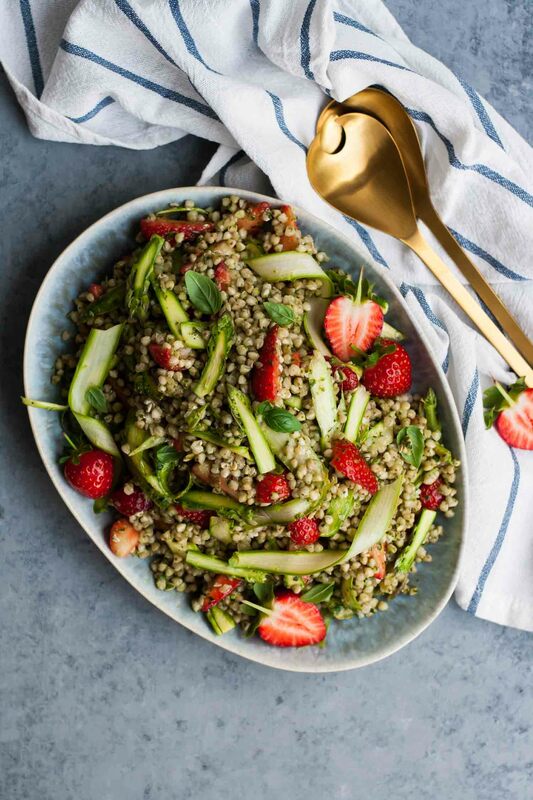 Perfect for barbecues and picnics alike, we’re talking fresh, simple salads which make the most of the abundant summer produce that’s available right now. We’re coming to the end of asparagus season, but it’s still very much available here in the UK and I intend to use it with wild abandon whilst I still can! 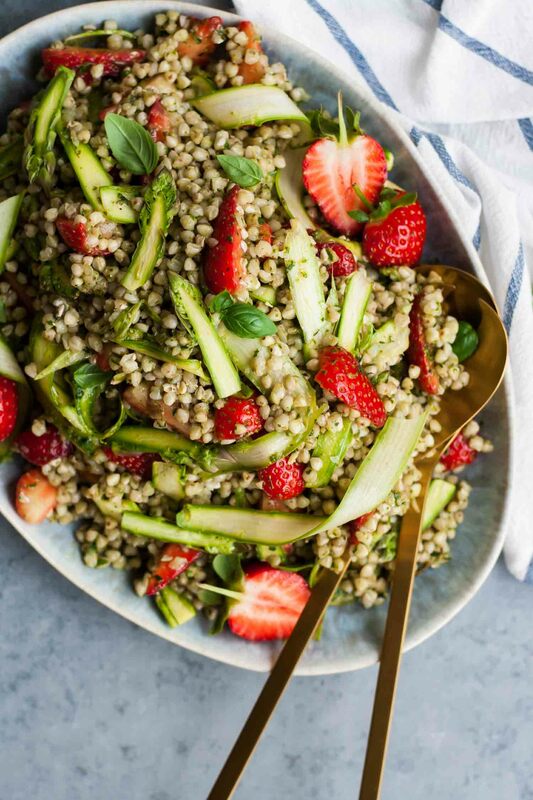 As should you, in this Strawberry Asparagus Buckwheat Salad. I love buckwheat, but I must admit, it’s a bit of an underused ingredient in my kitchen. More often than not, I use it as a side dish, but rarely does it feature at the centre of my cooking. That needed to change! 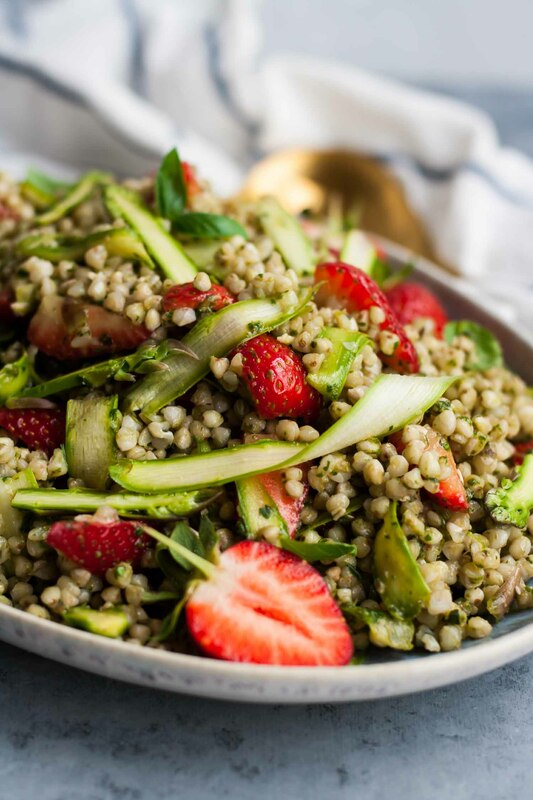 Instead of reaching for bulgur wheat or quinoa, I chose to build this bright and summery salad around buckwheat. It’s a pleasingly soft-textured pseudograin, with little pyramidal grains that look stunning in a salad like this one. In its raw form (as I used here) it’s a pretty shade of green, which happens to match the asparagus and strawberries perfectly! I mean, we eat as much with our eyes, don’t we? I certainly do. In fact, I’m a marketer’s dream in that respect! Produce a pretty coloured fruit or vegetable and give it a cutesy name and I’m sold. That said, asparagus and strawberries don’t need any dressing up to get me to love them. They’re incredibly delicious exactly as they are and especially together! For anyone who is doubting the combination of sweet and savoury here, don’t. 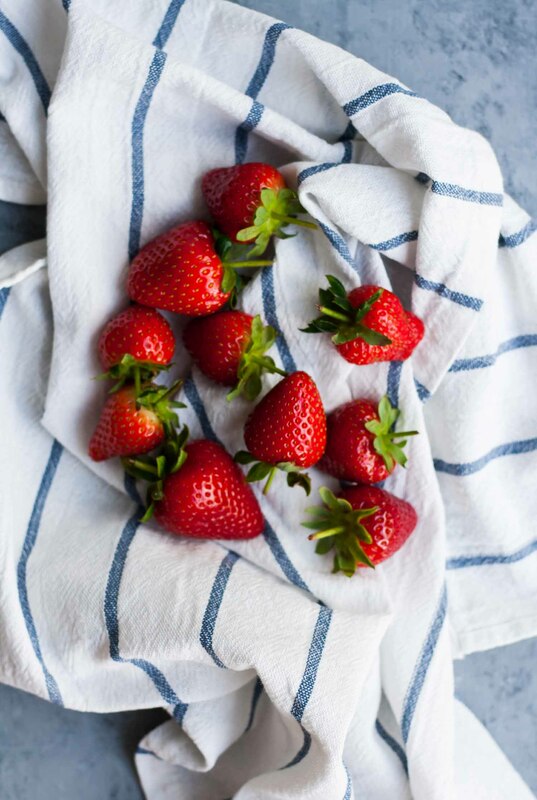 In fact, strawberries have a similar flavour profile and sweetness to tomatoes and you wouldn’t think twice about adding those to a salad now, would you? This salad would be nothing without those sweet little pops of flavour providing the ideal contrast to the grassy asparagus. I chose to leave the asparagus raw in this salad, though you could lightly sauté it if you prefer. 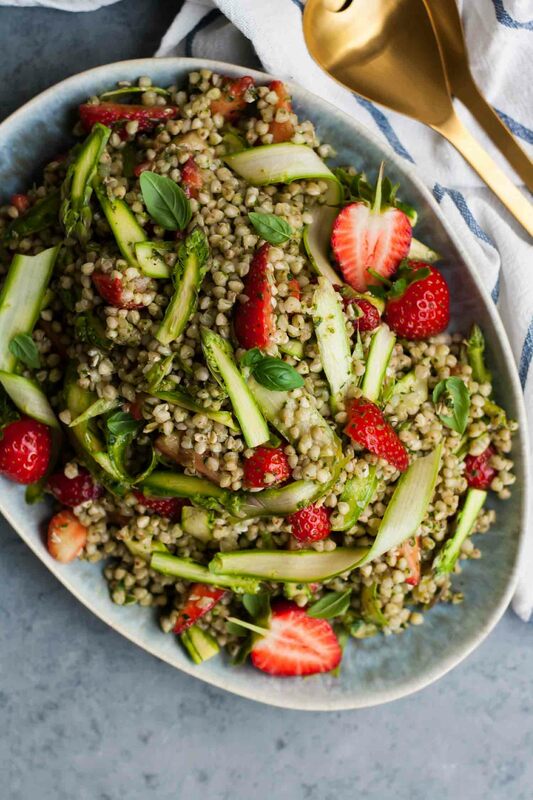 This Strawberry Asparagus Buckwheat Salad is quick and easy to prepare, making it the perfect option to bring along to summer gatherings. The salad is best eaten on the day that it’s made, so if you do need to make ahead, you absolutely can, I’d just recommend keeping the component parts separate until right before you serve. Cook the buckwheat according to the package directions (see notes). Hull and quarter the strawberries. Using a peeler, shave ribbons off the asparagus. Once it gets too difficult to shave the asparagus, just finely slice what's left. 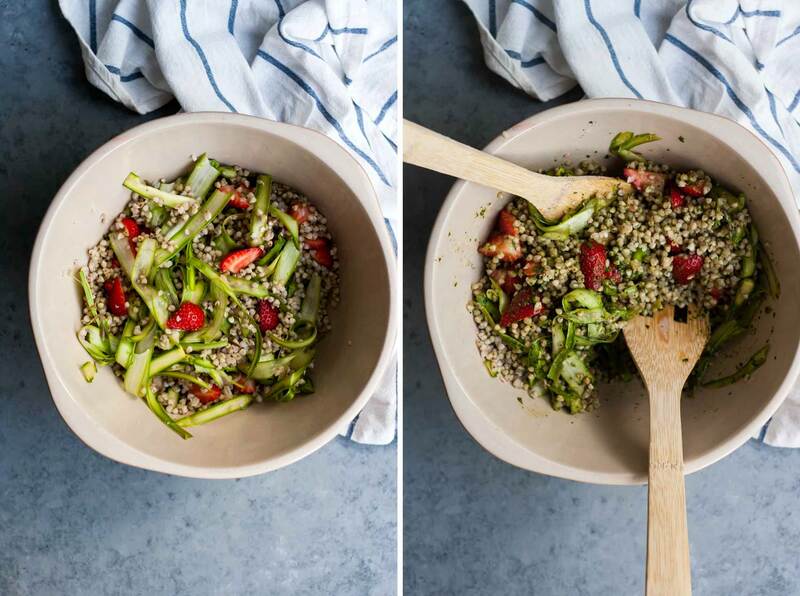 Toss together the buckwheat, strawberries, asparagus and dressing until combined. Season to taste. Serve immediately. Whiz all of the dressing ingredients together in a blender or small food processor. Season to taste with salt and pepper. Make sure you use a good pinch of salt. I tend to soak buckwheat overnight in plenty of water with a squeeze of lemon juice or a splash of apple cider vinegar. Apparently, doing this activates the buckwheat and makes it more nutritious. It also means that it takes less time to cook, normally less than 10 minutes. Doing this is completely optional. Larger asparagus spears work best in this recipe as they're easier to shave. 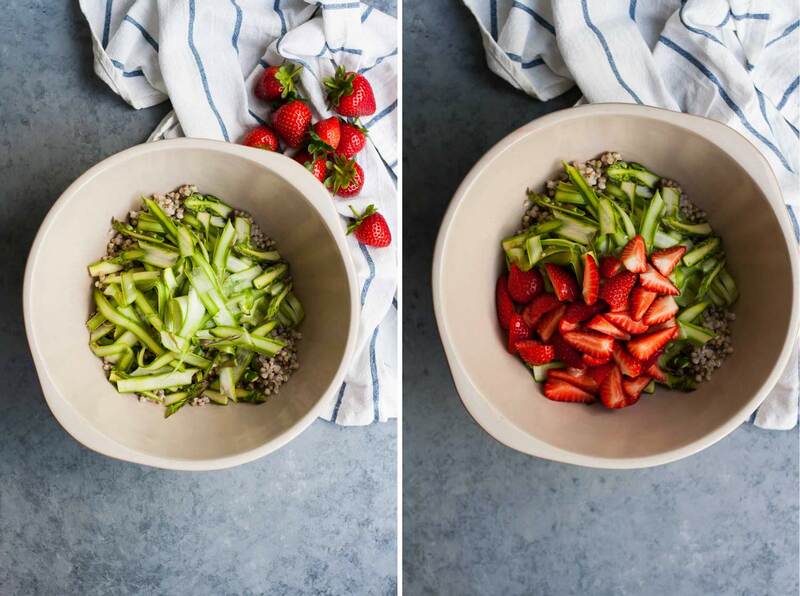 To make ahead, simply cook the buckwheat, prepare the strawberries and asparagus and make the dressing. Keep refrigerated until ready to serve. Toss together just before serving.